Treatment of obesity is necessary to reduce morbidity and mortality of itself, as well as secondary diseases such as diabetes and hypertension. 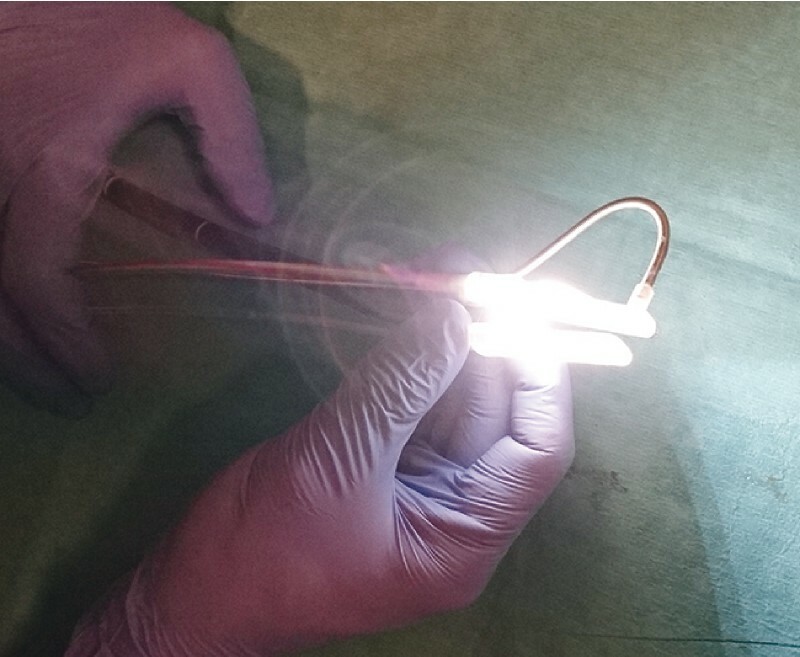 Endoscopic sleeve gastroplasty (ESG) is a fairly new technique, first described in 2013 . Since then, several methods have been used for the endoscopic creation of a stomach tube to reduce gastric volume  . In January 2018 we treated two patients by ESG. Prior to this, they had both taken part successfully for 1 year in a non-surgical multimodal treatment program for the morbidly obese, but thereafter had gained weight again. At the time of ESG, they had a body mass index (BMI) of 40.5 kg/m2 and 37.7 kg/m2, which along with their comorbidities fulfilled the criteria for bariatric surgery according to the German guidelines for surgery for obesity . After informed consent had been obtained, ESG was performed with the patients under general anesthesia in our endoscopy unit, using a GIF-H190 gastroscope (Olympus, Tokyo, Japan), CO2 insufflation, and the Endomina device (Endo Tools Therapeutics, Gosselies, Belgium) ([Fig. 1]), according to the method described by Huberty et al. . Prior to treatment, each patient received a single shot of antibiotic (2 g ceftriaxone). Afterwards they received proton pump inhibitors for 2 weeks and antiemetics on demand. Fig. 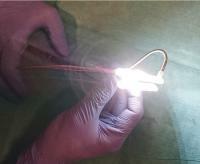 1 Photograph of the Endomina device with needle and suture material placed inside the flexible angled metal tube. The procedure was started in the greater curvature at the incisura with two stitches being placed, one above the other, and was then continued by stitching cranially in a row inside the stomach at the height of the second stitch to as near as possible to the gastroesophageal junction, leaving the fundus untouched. At the proximal end, we again placed two stitches one above the other. Based on the size of their stomachs, we used 12 stitches in one patient and 10 stitches in the other ([Fig. 2], [Fig. 3]; [Video 1]). The first procedure lasted 196 minutes and the second 99 minutes. Fig. 2 Endoscopic view: a before tightening of the suture between the anterior and dorsal wall of the stomach; b after tightening of the gastric suture; c into the stomach from the gastroesophageal junction at the end of the endoscopic sleeve gastrectomy procedure. Fig. 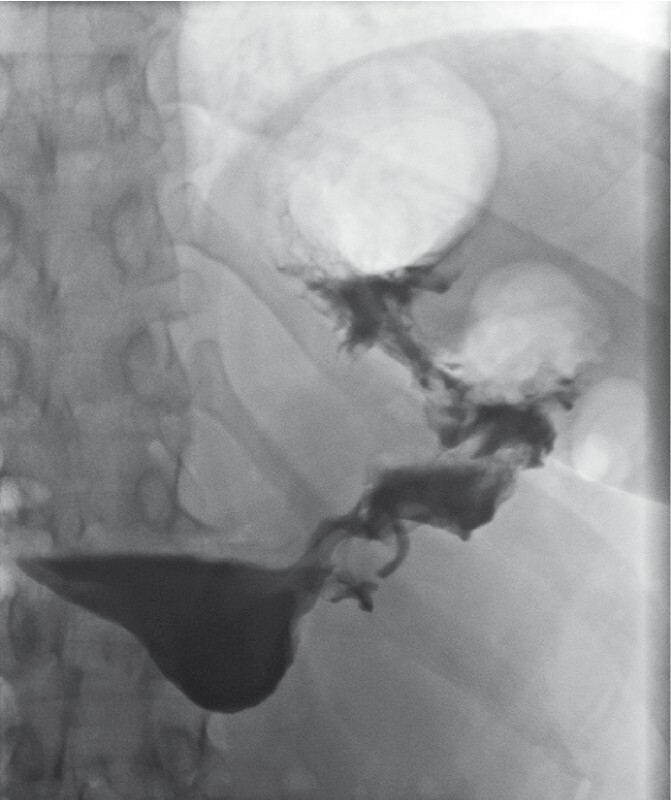 3 Radiographic image of the stomach 3 days after endoscopic sleeve gastrectomy. Video 1 Video demonstration of one full-thickness gastric suture using the Endomina device and endoscopic view after endoscopic sleeve gastroplasty. Georg Thieme Verlag. Please enable Java Script to watch the video. After the procedure, both patients felt a slight ache in the upper abdomen, but otherwise had no major complaints. For 2 days, they received liquids only and on the third day started on a low-calorie diet. Within 3 months of undergoing ESG, one patient had lost 7 kg and the other 14 kg (BMI 38 kg/m2 and 33.4 kg/m2). We conclude that ESG with the Endomina device is a feasible option for non-surgical anti-obesity treatment. The long-term effects of this treatment remain to be seen. Endoscopy E-Videos is a free access online section, reporting on interesting cases and new techniques in gastroenterological endoscopy. All papers include a high quality video and all contributions are freely accessible online.